Aah yes, I have a salad to share with you today. It’s fresh, healthy and full of color! A much needed departure from all the cooked foods we have been devouring lately. If you’re anything like us, we tend to eat more cooked foods in the winter. It seems to be somewhat instinctual but a good fresh and hearty salad is a welcome change. It all started with some kale & cabbage sitting in our refrigerator that needed to be used up quickly. Hope you enjoy as much as we do, we have now had it two or three times a week. Combine kale and cabbages, carrots. In another bowl, whisk together mustard, vinegar, mayo and citrus juice. Season with salt and pepper. 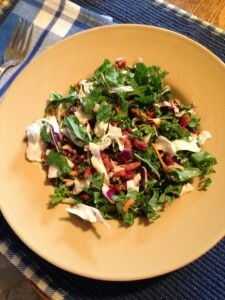 Drizzle dressing on the salad with sunflower seeds and bacon. Toss and coat. 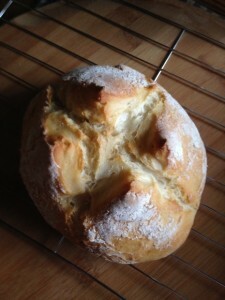 ** Serve with some fresh crusty bread! **Since this makes a rather large salad I plate individually and add dressing and toppings at time of eating so the greens stay nice and crunchy.